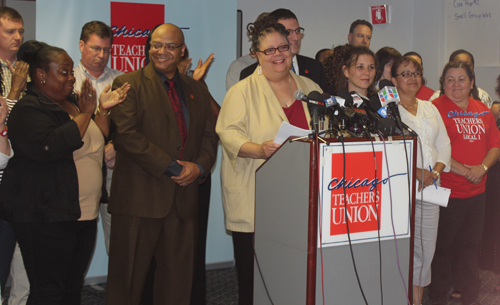 CTU President Karen Lewis announced that an interim agreement signed today with CPS was "a win for students and teachers and para professionals and clinicians." The agreement addresses teacher work day hours, 500 new teaching positions, and recall rights for some displaced teachers to be implemented at the start of the Track E school year. However, while Lewis said the agreement will "allow us to have a reasonable opening to Track E schools," she cautioned that many issues between the Board and the Union have not been resolved. The elementary school teachers work day will be 420 minutes (7 hours) and the high school teachers day will be 435 minutes (7 hours and 15 minutes). Under its previously announced "full" day, CPS had all teachers working 460 minutes (7 hours and 40 minutes). The student day will be 420 minutes for elementary students (the same 7-hour day announced in April), and 435 minutes (on average over a five-day week) for high school students (15 minutes less than what CPS originally pushed). CTU Vice President Jesse Sharkey (above) had responded to a Track E teacher at the CTU House of Delegates meeting on July 18 during the question period who wondered how she was supposed to handle the longer day hours while the Union and Board are still in negotiations. The interim agreement is necessary to avoid problems for Track E teachers. The work day hours for elementary teachers will be the same as they are currently (in open campus schools) and will increase 15 minutes for high school teachers. Substance photo by Sharon Schmidt.CPS will staff the elementary school day with 500 new teaching positions. Tenured teachers displaced in 2010, 2011, and 2012 will constitute the pool from which principals must hire the new teachers. "It is expected that the new hiring will include many recently-neglected areas of instruction, including art, language, library science and physical education, thus achieving a CTU goal of a better school day, not just a longer school day," Lewis said. CTU will be at the Board of Education, 125 S. Clark St., on July 25, 9:00 a.m. "to demand respect, job security, and that the board bargain over issues that really matter to students and educators," according to the CTU website. 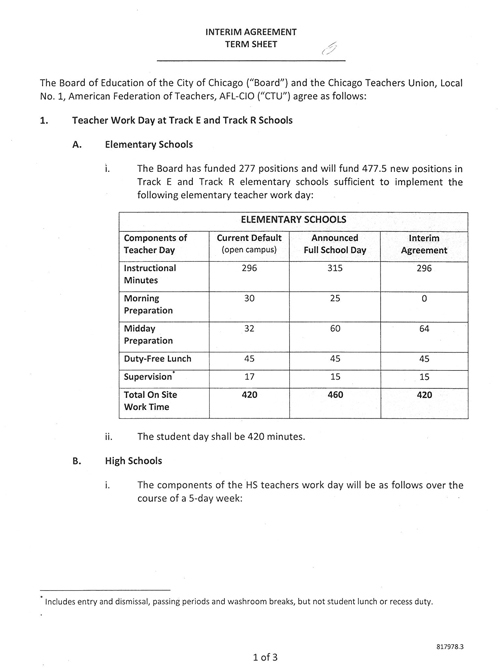 Second page of the agreement material distributed by the CTU.The interim agreement charts the components of teachers' work days — including instructional minutes, prep times, lunch, and supervision — as they are currently in the elementary and high schools, what CPS intended in the announced "full school day", and what they will be for the Interim Agreement. 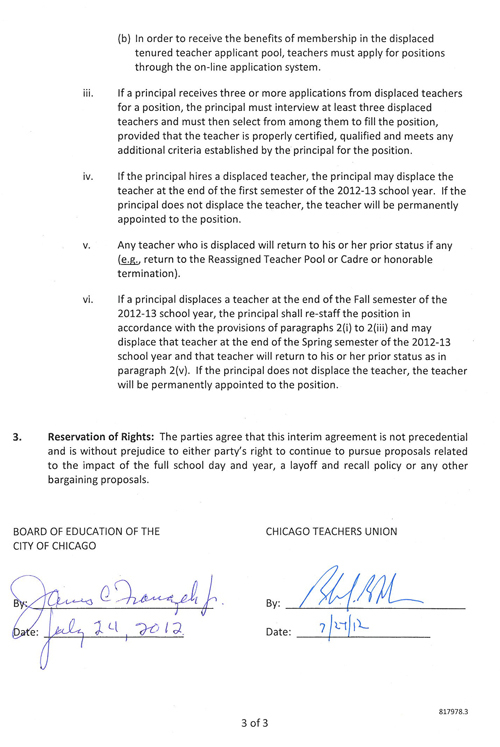 This interim agreement also states that CPS high school teachers cannot be asked to teach a 6th class. Programming will have to be redone to reflect longer class periods but only 5 classes will make a full load for high school teachers. At least one third of CPS high schools had made programs for teachers with each teaching 6 classes. Some schools were told this was the only option while others were allowed to lengthen existing class periods under the initial "longer school day" plans developed in schools. While I am very proud of our Union for standing up to the bullying tactic practiced on all Chicago educators this year, I am chagrined to think of all of the time spent in the past year trying to satisfy an executive order that was impractical from the beginning. Many people tried to articulate the issues that revolve around the longer school day, and yet, the powers that be refused to listen. Committees were set up and hours were spent with the Board of Education insisting that there was no room for negotiation. Time and again educators throughout the system brought forth reasonable alternatives that were met with a resolute retort that time was not negotiable. Now, we find out what many members knew all along. Everything is negotiable and the best decisions are those borne out of professional collaboration. I hope and pray that the Board of Education will continue to bargain and discuss in good faith the educational and fiscal issues that confront this City. Ultimately, everyone is served when the Board of Education listen and respect the professional judgment of those whom it employs. How are elementary school teachers supposed to have a school day that is the exact same length as the class day? That would mean they'd be walking in with the students and walking out with them and no prep before or after class. This does eliminate the prep time before school. It also adds a 45 minute lunch and a 64 minute prep. I'm not sure how that affects the overall amount of time people will spend in the building beyond 7 hrs. Why should we believe Rahm??? As to the start of schools that our Mayor keeps talking about in early August, I have to say that I for one do not have much faith in him. We bargain in good faith and he does not. We show up to the bargaining table and he does not,nor does the Mayor's choice for CEO. which ask adults to text in if they disagree with the strike authorization vote. Rahm's people don't allow for an alternative text vote, like all others do. They don't want to hear an alternative side. We break the barrier that Mayor Emanuel and his cronies set for us regarding the UNDEMOCRATIC and UNAMERICAN 75% for a strike authorization vote. Rahm's people make the law so that anyone who does not vote is automatically cast as a NO vote. Again, I have to say, I feel that is UNAMERICAN and UNDEMOCRATIC, and smacks of the style of governments we have been taught to distrust: Communism, Tyrants, Dictatorships, Totalitarian regimes, Fascists, like Iran, Syria, and North Korea to name a few. And we get a vote of nearly 90%! With about 8 1/2% being absent from the vote, and about 1 1/2% actually voting yes. We listen to our Mayor talk about the needs of the children, over and over, ad nauseum. Yet we have a need for air-conditioners in our classrooms, more security in our hall ways, more counselors, psychologists, psychiatrists, and social workers to deal with our children's many needs, more physical education instructors so our Juvenile Diabetes epidemic amongst our young ones is halted, and on and on. We listen to our Mayor say that Charter schools perform better than our regular schools. And our regular school children correctly contradict Rahm, yet he never acknowledges his "mistake" which others might call an outright lie. A chance to stand with the children and state that he made a mistake. No way, Rahm is not admitting any mistakes, any, ever! We listen as Mayor Emanuel tells all that he is going to conduct a "TRANSPARENT" government, but he REFUSES to open up the accounting books so that we can see the real numbers. 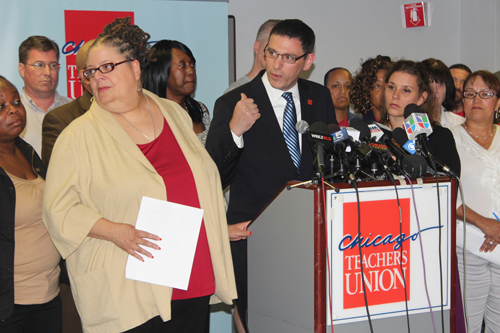 We listen as Rahm says he has no money to give the teachers a 4% raise, which was promised to them in their last contract. And then Mayor Emanuel gives the teachers money to the police. And the cost of living keeps on going up, and teachers make due with less, as usual. We listen as Rahm doles out large sums for NEW charter schools, while draining money from our regular schools, takes the CPS budget down to ZERO, so he can claim he has no more money to spend AND provides Moody's with the ammunition they need to downgrade the CPS Board of Education's ability to borrow money! And the Mayor talks about how important the middle class is, while he does everything in his power to destroy that very same middle class. Break the unions and you break the back of the middle class! No Unions, no middle class, and Rahm knows this, as do his cronies. They don't care! How much more blathering our we going to listen to? From TIF money to how much time Rahm spends with his heavy DONORS, to his relentless verbal assault on teachers and his outright desire to break the Chicago Teachers Union, with all other Unions/Fire & Police etc. on that HIT LIST as well, I ask why should we believe Rahm? about anything? about anything he says, ever? I say we don't give Mayor Rahm the ability to make statements like: "schools will open on time," unless he actually bargains in good faith and starts talking respectfully about the highly educated, highly trained, highly experienced, thoughtful and respectful, human beings who actually work with the children Rahm claims to care so much about. (Rahm's attempt to verbally undercut teachers credibility and respect amongst the parents, students, and communities they teach in has backfired so he has, for now, stopped saying this himself, but his cronies continue to crow on and on in a verbal onslaught that is relentless). When he speaks respectfully and bargains in good faith, then I believe we can start talking about opening schools on time, not before that. And when he has agreed to a contract that teachers agree to, then, and only then, can we state that opening these schools in August is a done deal. which is how he made his "more than $18 MILLION with the investment firm Wasserstein Perella & Co. between the time he left President Clinton's administration in late 1998 and was sworn in as a congressman in January 2003, with JUST SOME of his investment income held in his Rahm Emanuel Blind Trust, managed by JP Morgan Chase & Co. reported at $57,946.00in "ordinary dividends" from that trust in 2009. Rahm is the epitome of the 1%. I will personally believe him when I see it happening, and when I see it in writing. I ask us all to take this into consideration. I'm a little confused about the HS day. (1) Is the 14-minute increase in the teacher workday an "average" over the week? I'm assuming that there is still an early-release day for students one day per week, and that teachers will stay approximately 70 minutes (14 x 5) late that day for professional development. (2) Won't this increase class size? The same number of students are required to spend an extra 46 minutes at school (although there is no increase in graduation requirements), but the teacher workday remains the same (5 classes) and there are no additional teachers to be hired in the high schools. I have to assume that the CTU bargaining team examined the issues relating to self contained special education teachers in elementary schools and the use of specials art, music, and PE (either pull outs or push ins apparently) to offset work time. Can someone please explain how this is going to work if the child's IEP requires direct services during these specials? Is there a provision anywhere for hiring additional special education staff to cover the specials? Maybe I am missing something? Dear Danny.The devil is in the details. Without the actual signed contractual language we will not know the answer. However I remember when every HS teacher had a "duty" period as well as a CP period and a PP period. What I read in the intern agreement said nothing about principal-directed periods.